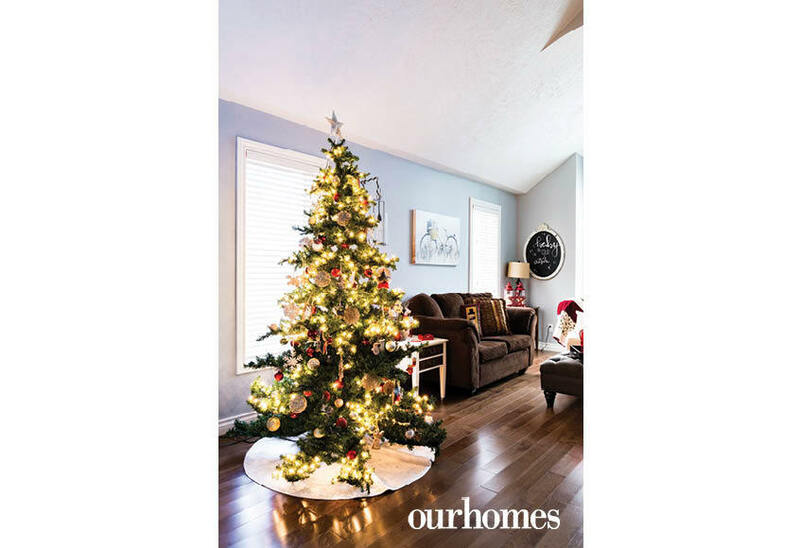 A family home in Port Elgin shares the magic of Chrismas. 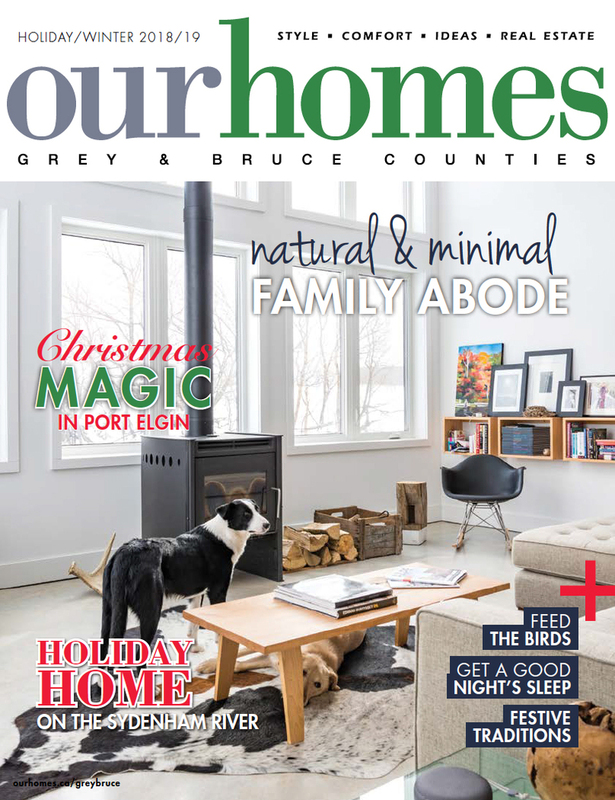 A version of this article originally appeared in the Holiday/Winter 2018/19 issue of OUR HOMES Grey & Bruce Counties, p.66. Find local businesses in our Grey Bruce directory. 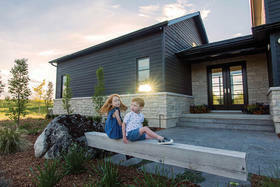 When Steve and Kristen Biederman started their family, they knew it was time to move from city living to a quieter setting. 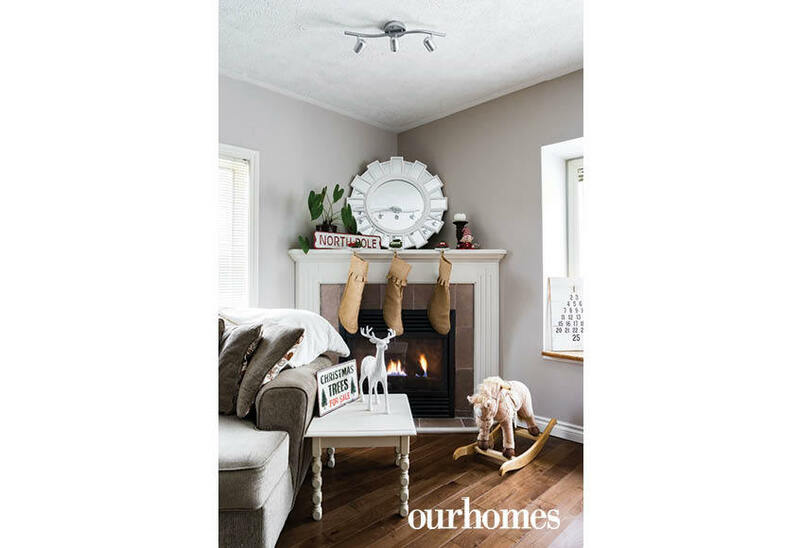 With Steve having grown up in Port Elgin, they decided it was the right place to raise their two boys, Andy and Alex, in a beautiful home. 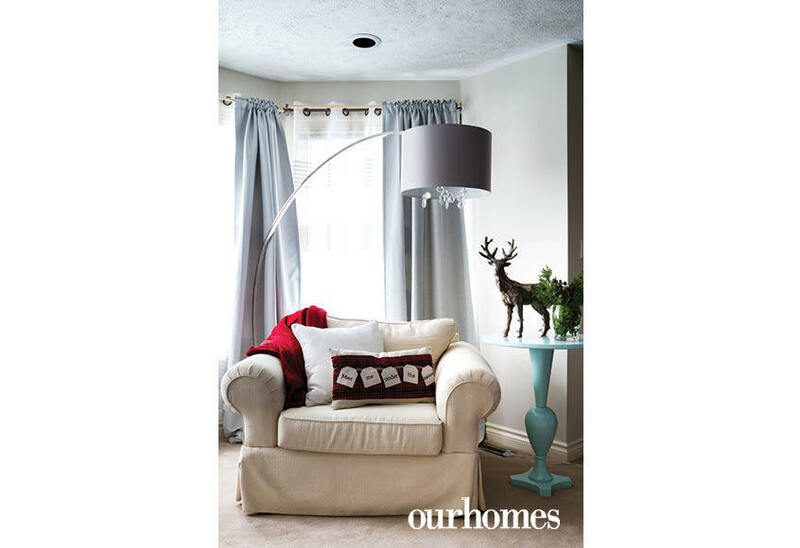 The new-to-them home was larger than their previous home in St. Catharines and provided ample space to redecorate. Cathedral ceilings, a large oak staircase and newly installed hardwood flooring from South Bruce Flooring all create a grand entrance. 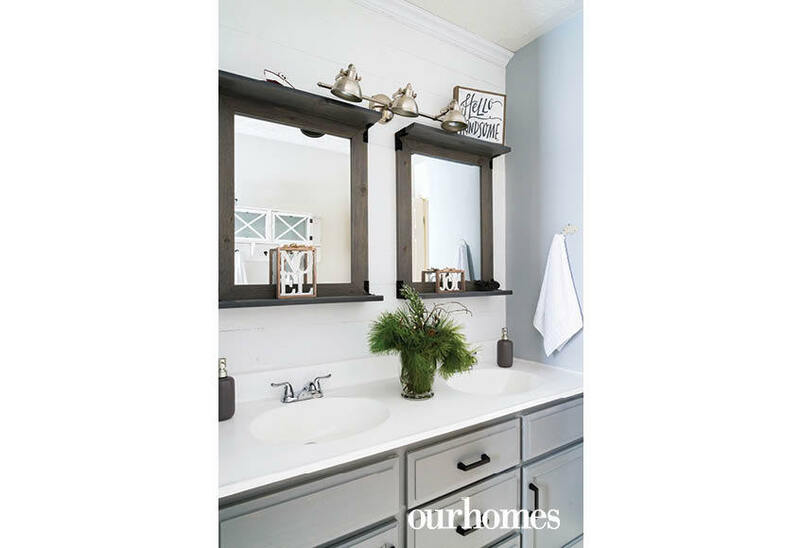 Working alongside designer Heather Smillie of House Rules Design Shop, Kristen chose a colour theme of light greys and blues, including Thunder by Benjamin Moore and Quest by Pittsburgh Paints, all from Martin’s Home Hardware. 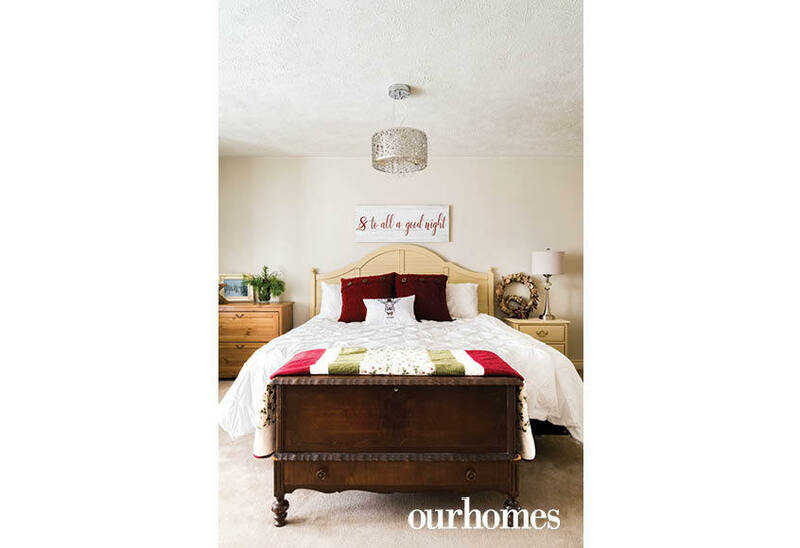 This offered Kristen a neutral canvas to harness her DIY skills . 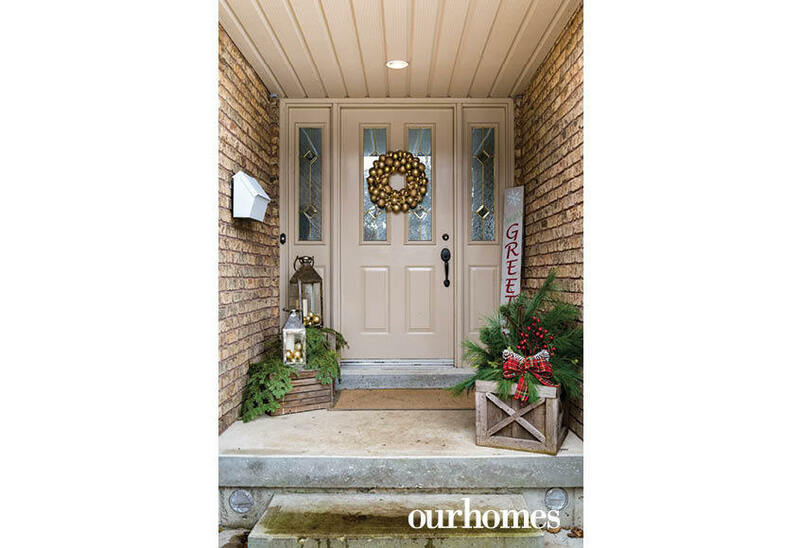 What better time to showcase her talent than on the Cham-bette’s Christmas Tour of Homes in Port Elgin. 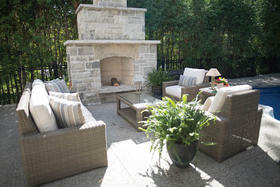 Kristen worked with interior decorator Kerri Hardman-McLean of Interior Motives and Co. to decorate for the home tour. 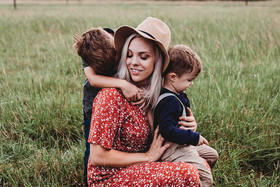 “The theme was warm, rustic and casual,” Kerri explains. 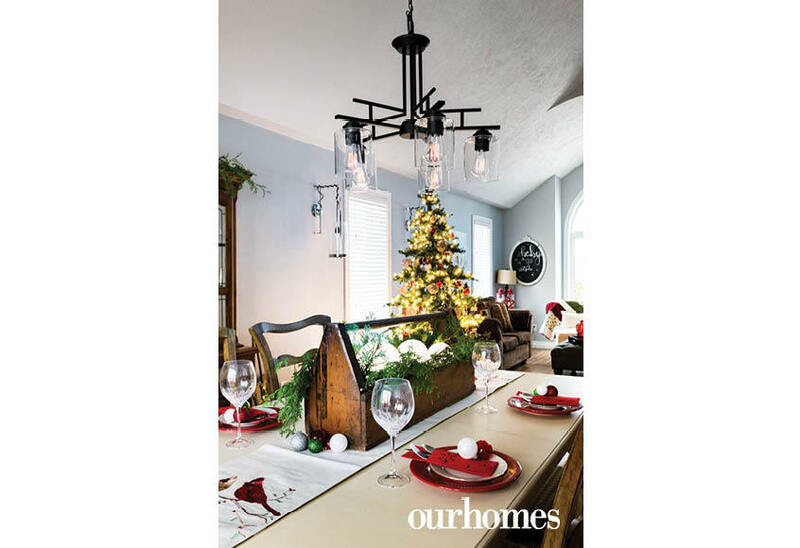 They created a more formal feel in the living/dining room area for Christmas entertaining. This is where the Christmas tree lives, enhanced with live greenery on the reclaimed-shelving and chalk-painted tables. 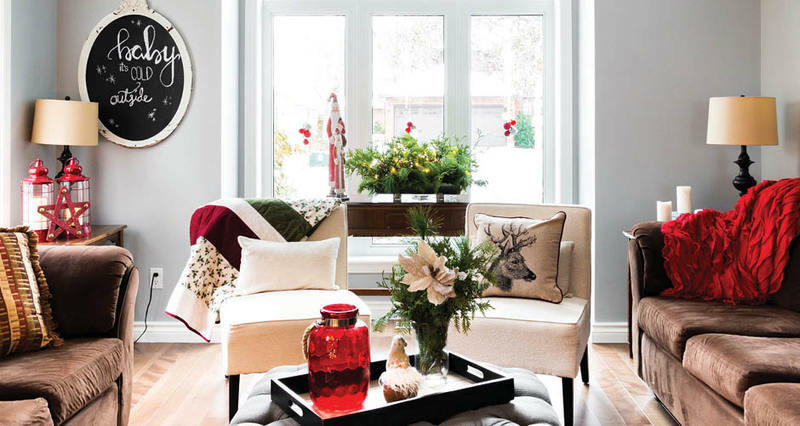 Red and white pillows and throws add comfort to the space. The elegant table is set for company coming. On the opposite side of the foyer, the sunken family room is geared towards the children. The room is a cosy retreat with a fireplace donned in jute stockings and signs for the North Pole, the perfect setting for children to play with new toys on Christmas morning. Additional vintage signage and a wooden rocking horse enhance the space while advent calendars and burlap wreaths add to the rustic theme. 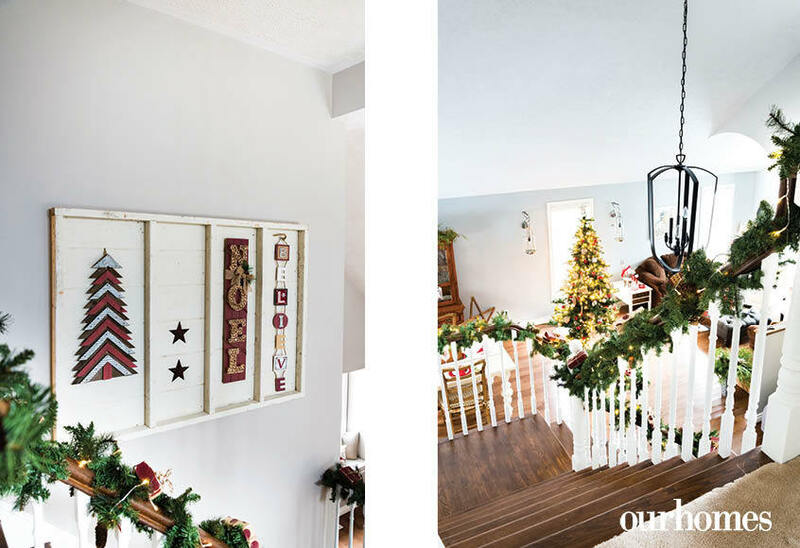 More family fun awaits in the kitchen where a hot chocolate station and fun Christmas decorations keep the magic of Christmas alive and well in the Biederman home. Santas of all shapes and sizes, along with reindeer in the large bay windows of the eat-in kitchen overlook the ravine of the Rail Trail near Mill Creek – a beautifully treed, natural setting in Port Elgin. 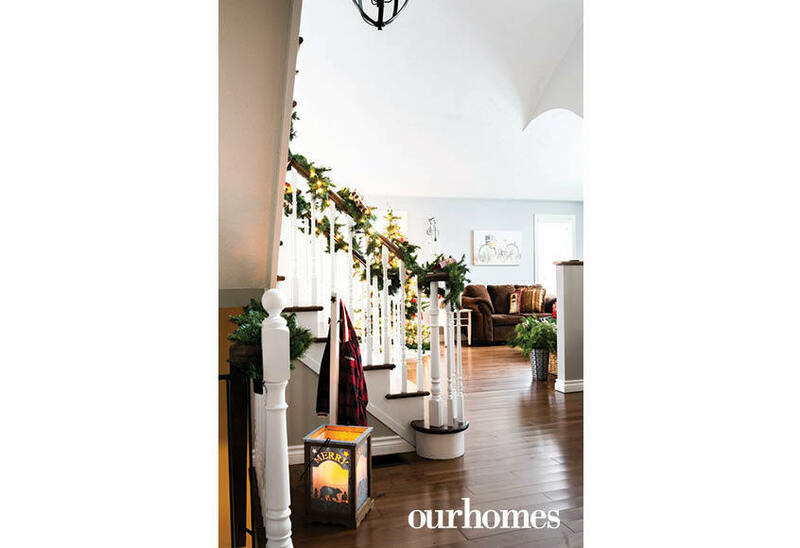 Welcoming lanterns, natural greens and red accents set the tone of the Christmas feeling on the inside of the home. 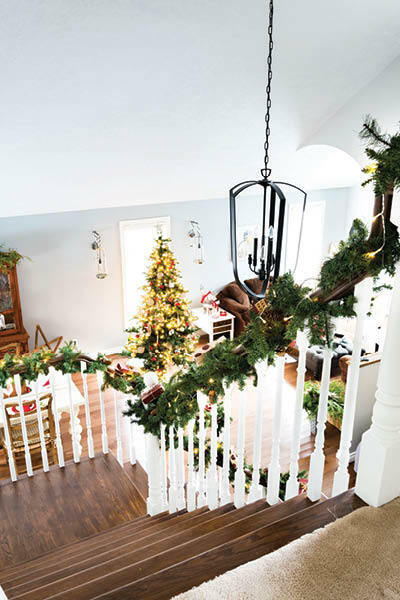 This handsome staircase with white risers and dark wood treads gets dressed for the holidays with garland and twinkle lights. 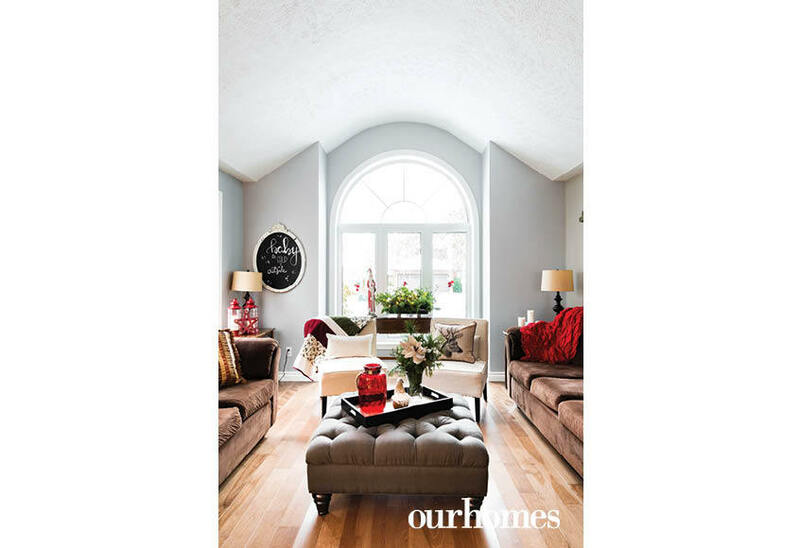 This bright sitting room has a pair of brown sofas and a tufted ottoman. A pair of slipper chairs let the light pass in through the large arched window. Casual holiday décor in traditional red and green gives the space a festive vibe, while a on oval chalkboard sign lets messages be changed out seasonally. The tree is trimmed in classic red, silver and white. 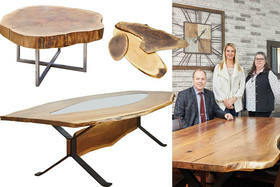 The dining table centrepiece is an antique toolbox filled with pine and cedar boughs and large LED glass balls. 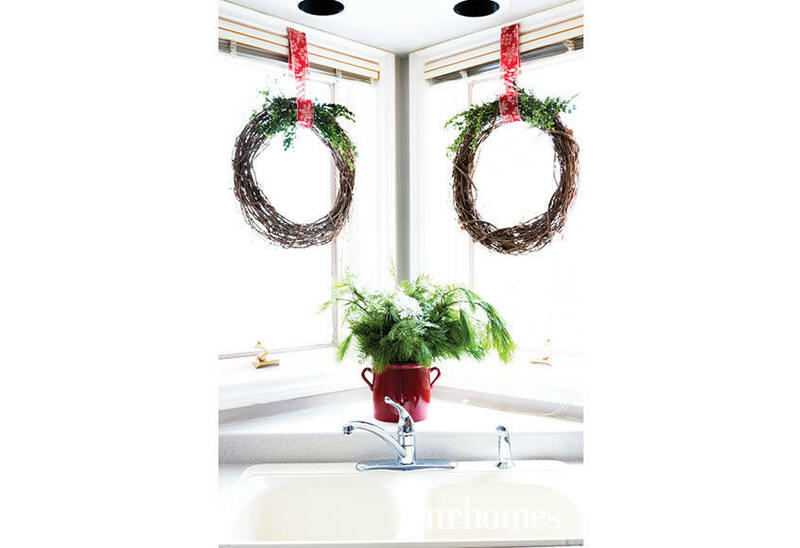 Grapevine wreaths in the windows with accents of red and natural pine boughs are an easy way to add festive flair to this corner of the kitchen. 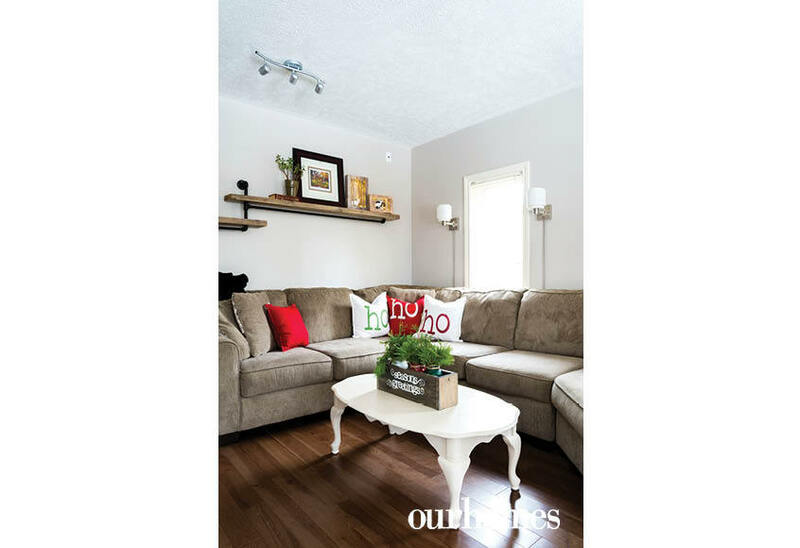 The cosy sectional in the family room is a great spot to watch holiday movies. A coffee table is upcycled with bright chalk paint. A corner fireplace has a simple tile surround. 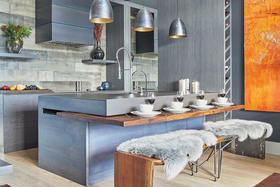 Seasonal décor is pared down for an uncluttered space. A side table is chalk-painted a bright white. A family of felt reindeer are dressed for the winter weather. 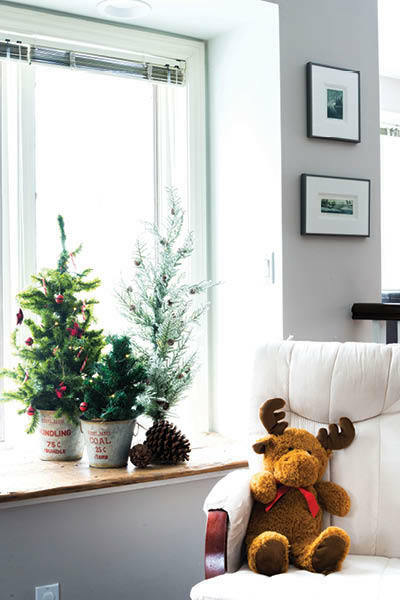 Snowmen on the chalk-painted plant stand add an element of childhood fun to the holiday décor. 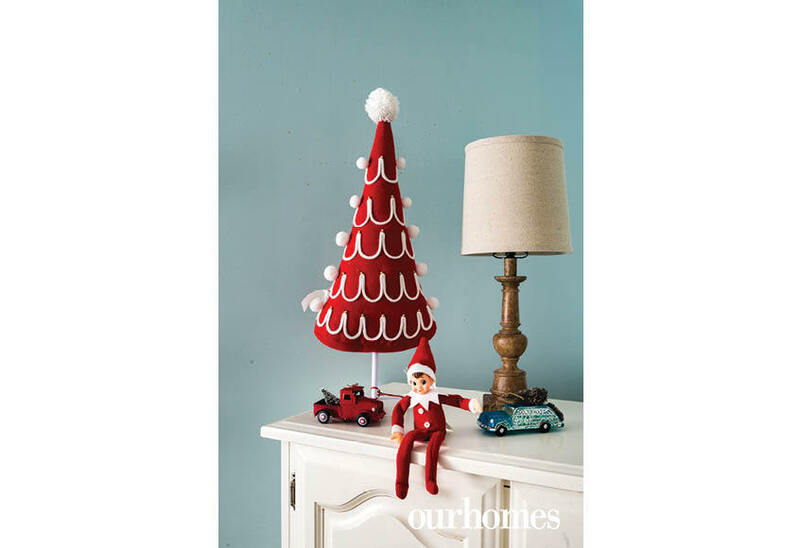 This simple advent tree is a fun way to count down the days until Santa’s arrival. Decorated miniature Christmas trees are on display in the bay window, which overlooks the backyard. A wood pallet has been reimagined into custom holiday wall art. Like a scene from a holiday movie, the tree stands at the bottom of the staircase for little ones to find all that awaits on Christmas morning. Mix-matched furniture is right at home in this creative room. Red knit pillows and a red and green family quilt add a dash of the season to the master bedroom. A comfy reading nook in the principal bedroom has a chalk-painted turquoise side table. The kids’ bathroom was a DIY update with paint, mirrors and . A bench for this child’s room was made from the head and footboards of his great-grandparents’ bed. The footboard was cut in two to provide the armrests and the headboard serves as the back. 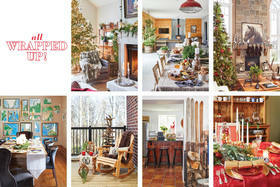 The room is given a blast of seasonal joy with a lettered sign. 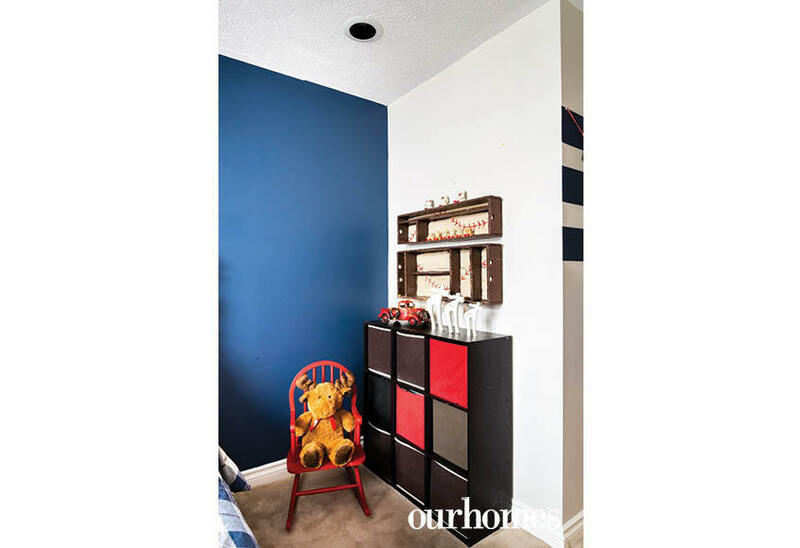 Red accents in this boys’ room are easily turned festive with a touch of reindeer. The deep blue wall is grounding. The infamous Elf-on-the-Shelf keeps an eye to report back to Santa.